There is now an online Shrine to the Goddesses Sif and Thrud on the Northern Paganism site. I admittedly run into cases of "reasonable minds differing" regarding some of the material over there, but that is only to be expected with our human explorations of faith. Let our Gods and Goddesses be hailed, loved, and honored in many ways and places! 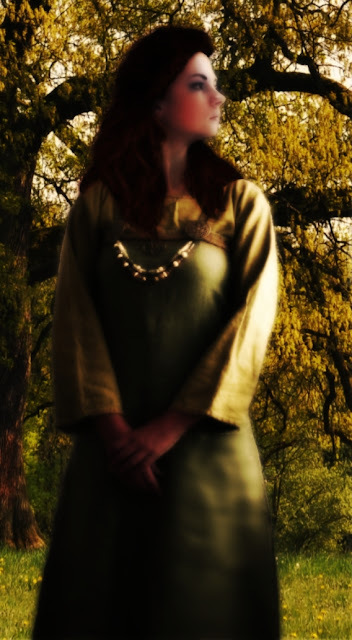 Today, here is devotional photo art made for Thrud, the daughter of Thor and Sif. A full version of this artwork is also available at DeviantArt. All the stock for this piece comes from three very generous artists and photographers on DeviantArt. The lovely female face and the red hair are from the Kechake-stock gallery. The traditional Viking dress is from the Mizzd-stock gallery. Finally, the oak tree in the background is from the LuDa-Stock gallery. This picture was created with Paint.NET art software, and is under the usual Creative Commons Copyright License: Attribution-NonCommercial-ShareAlike (CC BY-NC-SA). Hail Thrud, beautiful as morning rays! In the quiet joy of dawn.